There’s a Dar Williams song, “Mark Rothko Song,” that affects me. I have listened to it over and over again over the past ten years, and though I never knew who or what it was about there is something about this song that makes my heart shift every time I hear it, that makes me feel something: something warm and also like deep blue currents, something both smiling and melancholy, something incandescent like flashes of sunlight on the surface of dark fathomless water. Something I can’t contain with words. Despite my love for the song, I only cared about how the song made me feel, and I never bothered to research Mark Rothko. Then, last year, quite by accident, I came face to face with his work. 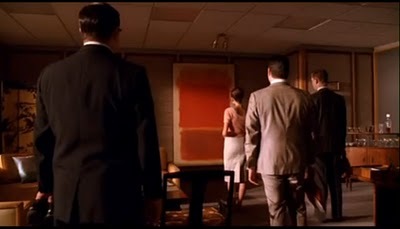 In season two of Mad Men, on the wall of Bert Cooper’s office, was a Rothko. I saw his work for the first time, and my heart shifted. When I saw the painting I felt the same feelings I feel when I listen to “Mark Rothko Song” and I thought, “Ahhh, now I see,” and I understood, for the first time in my life, abstract art. Many people make the same claim when they see a Rothko or a Jackson Pollack: they snort and say, “I could have done that!” But the thing is, they didn’t. And I would argue that they couldn’t. Sure we can all draw rectangles, maybe even color them in, but I know I can’t mix those paints: that saturated sunshine yellow, the white like shimmering silk, that vermillion red as rich as blood. I can’t scrape a pallet knife to create dimension, I can’t achieve proportions and balance, I can’t intuit where to place the white blocks, the orange blocks, the turquoise blocks, evoke tension with shape, movement with spatters or brush strokes or angles; I would not be able to stop when it was time to stop, to restrain myself from muddying the colors. I was walking with my friend last week and I told her, “We finally got curtain rods and throw pillows for our living room.” We panted and pumped our arms. “All we need now is art,” I said. The new spring heat was getting to us, and she perked up. She’s a photographer and likes talking art. “Oooh, what kind of art are you looking for?” she asked. My heart thumped as I thought about the Rothkos I binged on, the Rothkos I browse on a weekly basis since seeing his painting on Mad Men. His yellows like sunlight blazing on the wall, the electric reds, the horizontal blocks that make me feel stable, that make me feel like the ground is solid beneath me, unlike vertical compositions I’ve seen that make me feel like I’m sliding off the edge of the world. She cocked her head at me. “Go on,” she said. In a writing craft piece for The Daily Post, Let the Reader’s Imagination Do the Heavy Lifting, Krista Stevens advises the writer to hold back, to leave things open to the reader for interpretation. To let the reader create his or her own experience. 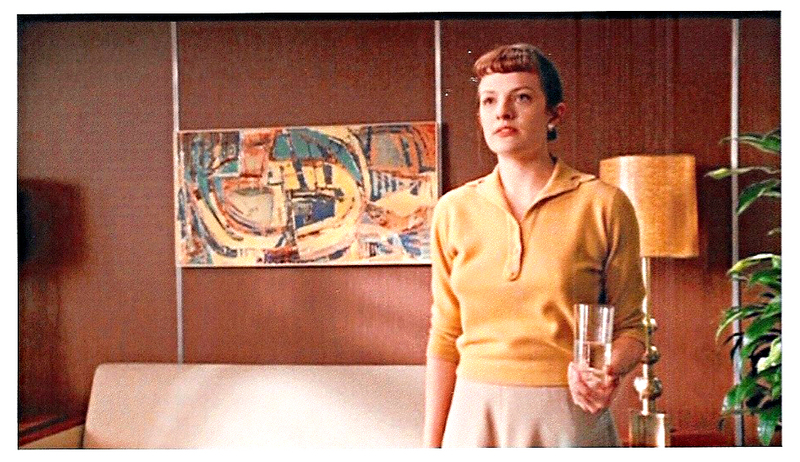 The evening I read her piece, we watched an episode of Mad Men and I started noticing the art on the walls in Don’s office, in Peggy’s office, in the meeting room at Sterling, Cooper, Draper, Pryce. I thought about art in the terms Krista had written about, and how abstract art leaves interpretation to the viewer. Whereas a painting of an object puts you in a box — a boat is always a boat, a tree is always a tree — with abstract art there is no box. Concrete art is relatively closed, it is mostly interpreted for you by showing you exactly what it is (a pear, a flower), while abstract art refrains from explaining itself to you or telling you what to think. Abstract art encourages you to create your own experience. The creators of Mad Men are smart. Don Draper and the creatives display all the behaviors of successful creative types: they free associate, they alter their consciousness, they think, they stare into space, out the window, at a real life dramatic scene. They nap. A lot. And they hang abstract art on their walls. Throughout the offices of Sterling, Cooper, Draper, and Pryce are pieces of art that box nobody in – pieces of art that, in Krista Stevens’s words, allow the viewer’s imagination to do the heavy lifting. On the walls of every creative is art that suggests, evokes, moves, art that nails nothing and nobody down, art that can be anything to anyone. Art I want to look at more because it makes me feel something, because it affects me, because my mind opens both into it and outside of it. This has been revelatory to me. A creation — whether a successful ad, a piece of writing, or a piece of art — does not have to be an end point, someone else’s rendering of a thing that already is. A rendering that says “This is a boat. It was a boat yesterday, and it is a boat today, and it will be a boat tomorrow and for all of eternity.” An artist’s creation can instead be a jumping off point, a piece of work that walks the viewer into his or her own story. I want this type of art for our home. I want a piece of art that doesn’t box us in, that doesn’t tell us what it is, that we can interpret however we like. I want art that makes me feel something; I want art that affects me. I want a painting that can be a city scape today, a forest tomorrow, contemplation yesterday, passion next week. That right now is warmth, just a second ago was chaos, and in five minutes is a tunnel into the best idea my creative self ever had. I love Rothko and love your rhapsodic ending to this post! First of all, “Mad Men” is the bomb. Secondly, I never paid that much attention to the artwork they hang on the walls. Now I just have another reason to obsess over every single episode. Yay! Currently watching season two of Mad Men and will keep an eye out for the art! Thanks! There is a ‘Rothko Room’ at the Philips Collection, in Washington DC. It’s a very small room with four very large Rothko paintings, one on each wall, and a bench seat in the centre. It’s the perfect way to experience his work. I was lost in colour for ages and emerged filled with inspiration. Amazing. Lovely prose as always. We went to the National Gallery of Art in Washington, DC over Thanksgiving and I didn’t realize there were Rothkos there. I walked into a room and I think I may have squealed. Thank you for the tip about the Phillips Collection – I’ll have to go there next time we visit. How I love the piece in your living room. Even more, now, knowing the mind behind it! It may be the Viognier talking, but I’m thinking of an art trade program – I could have a boat for a month, a mountain for a year, and stare at them and love them for their permanent and fleeting natures, combined. I read up on Rothko, listened to your fav song…Mark Rothko Song…and looked at some of his paintings. Joni Mitchell said You don’t know what you’ve lost ’til it’s gone….sometimes I feel like I was born w/one foot in the grave; don’t dwell too long in the blue zone, haha! BTW….I often look for titles of books people are reading in movies, etc., check them out. Matt Damon mentioned A Peoples History of the U.S. byHoward Zinn, very interesting reading. There is a photo of your dad as a little boy, poring over a book, I’ve always wanted to magnify the letters in the book/photo, see what he was reading. You’re so right, Andrea. It’s important to keep an open mind in all things art-related. You don’t have to like everything, but the danger of prejudging or ruling out of hand is you’ll miss some real gems. I enjoyed this post and the pictures you included. Good luck with finding the artworks you seek. I attended a John Bellany (Scottish Artist) exhibition last year and was blown away by his weird and complex portraiture – his paintings tell stories so appeal to my writerly inclinations.